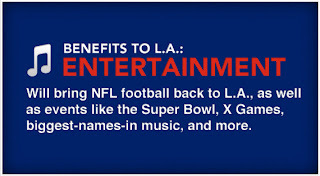 We’re working to build a state-of-the-art sports stadium, entertainment, and premier convention center in downtown L.A. by 2015. The Farmers Field project will create jobs for our community, boost our economy, and finally bring NFL football back to our city. It’s jobs. It’s a long-term boost to our economy. It’s a state-of-the-art facility in downtown L.A. Building Farmers Field and expanding the convention center is good for Los Angeles no matter how you look at it. Here are the facts. Location: Downtown Los Angeles at the current West Hall of the Los Angeles Convention Center, alongside the STAPLES Center and L.A. Live. Size: Total new Event Center would be 1,700,000 gross sq. ft. with a retractable roof. 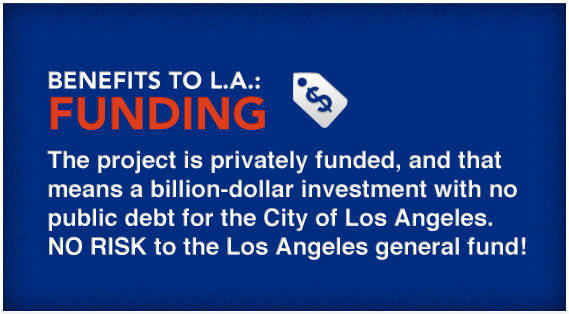 Funding: $1 billion investment for the development of Farmers Field, all privately funded (this means no debt for the City of Los Angeles). Parking: 32,000 parking spaces within a 15-minute walk to Farmers Field are already in operation. Traffic: To limit congestion, Farmers Field will utilize four freeways and over 20 interchanges (on/off ramps), and continue to use the successful traffic and parking model employed by STAPLES Center, L.A. LIVE, and the Los Angeles Convention Center. Biggest and best domestic and internal conventions that attract thousands of visiting attendees annually. Sporting and entertainment event that showcase the best athletes and stars. 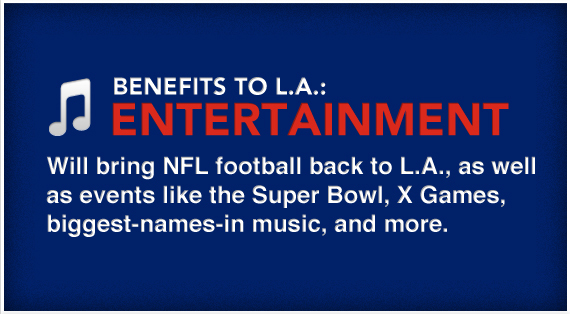 Finally bringing the best game in America — professional football — back to L.A.
Contiguous hall space is critical to the success of exhibits and tradeshows. 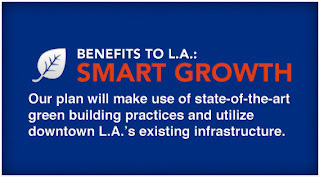 This is our chance as a City to fix the LACC once and for all. 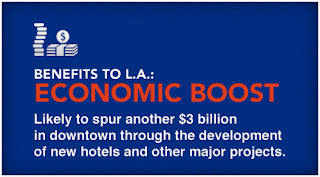 When completed, Farmers Field and the expanded convention center will immediately position downtown L.A. as one of the nation’s premier destinations for sports, entertainment, and conventions. Farmers Field allows Los Angeles to finally compete for many of the top 50 conventions the current Los Angeles Convention Center is too small to host. The dramatically improved event space will attract an estimated 80 annual event days and increase economic activity in the downtown core. Remodeled New Pico Hall with be open before the West Hall is constructed into Farmers Field making sure that no events currently booked are disrupted. AEG strives is committed to making Farmers Field one of the most environmentally friendly stadiums in the world, learn more. The Los Angeles Convention Center currently ranks 15th in the United States by size, However, with the addition of Farmers Field and the New Pico Hall, the LACC would be in the top 5 in the U.S.
Our entire city will benefit from higher hotel occupancy rates, more jobs, and better access to important, innovative industry events. Learn more about how the L.A. community will benefit from the Farmers Field project. Or learn how you can get involved now. 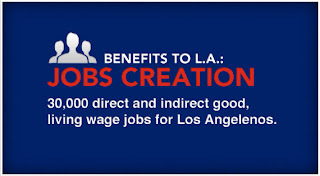 The project would create between 20,000 and 30,000 temporary and permanent living wage and union jobs. Those jobs would be everything from construction and hospitality to stadium operations and convention center event management. $1.9 billion in output and support into the community. 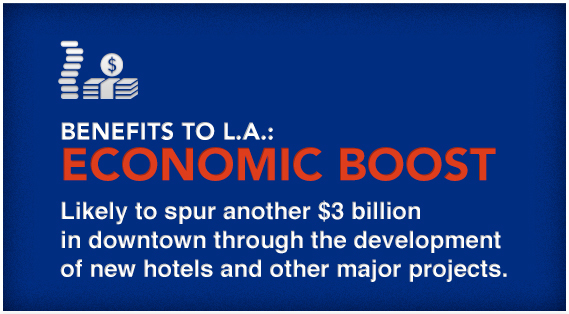 $378 million in direct expenditures into the Los Angeles economy. The upgraded convention center with increased exhibition space would propel Los Angeles to #5 in U.S. convention centers compared to #15 now. An expanded convention center could mean at least 80 annual booked event days in downtown L.A. The new Event Center would have a total of 1.7 million gross square feet and a roof. 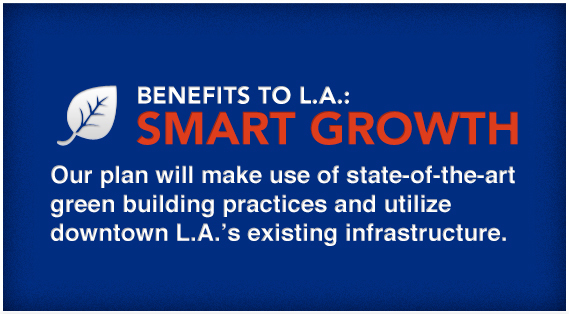 Learn more about improvements to the Los Angeles Convention Center. The complex can serve as the home field for four teams simultaneously. A state-of-the-art Farmers Field would allow Los Angeles to attract major events such as the Super Bowl, Pro Bowl, NCAA Final Four, Rodeos, Motor Cross, other collegiate championships and Olympic Games among others. Farmers Field's location will utilize existing infrastructure and investment already made to service the region. The project is convenient to and accessible by three major metro rail lines (red/purple line, blue line, and exposition line), and further provides connectively to Union station; the remainder of the Metro Bus and rail system; and other local and regional transit operators including the 40 bus routes that directly serve the site area. 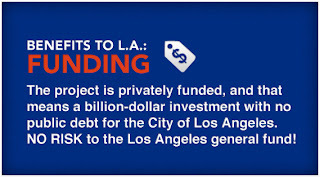 The project site is also served by more than 20 freeway interchanges and 4 major freeways. The new facilities will continue using the successful traffic and parking model employed by STAPLES Center, L.A. LIVE, and the Los Angeles Convention Center to manage traffic and parking. This is a proven model to accommodate large events. There are currently approximately 32,000 parking spots within a 15 minute walk of Farmers Field and 10,300 of them are onsite!